Oligodendrocytes — brain cells that wrap themselves around neurons to produce myelin — are much more diverse than previously believed. Scientists in Sweden, using a new type of sequencing, have discovered more than a dozen different kinds, including an oligodendrocyte subtype involved in motor learning, a finding that might spur new research into protecting against the loss of motor skills in MS. Researchers in the study, “Oligodendrocyte heterogeneity in the mouse juvenile and adult central nervous system,” made use of a new sequencing method that has revolutionized the way we view cellular processes. Earlier studies had to contend with visual differences between cells, or studies of individual gene transcripts — rather blunt tools, it turned out. But a powerful sequencing technique called single cell RNA sequencing now allows scientists to take a snapshot of what a particular cell is doing, mirrored by the activity of all its genes. 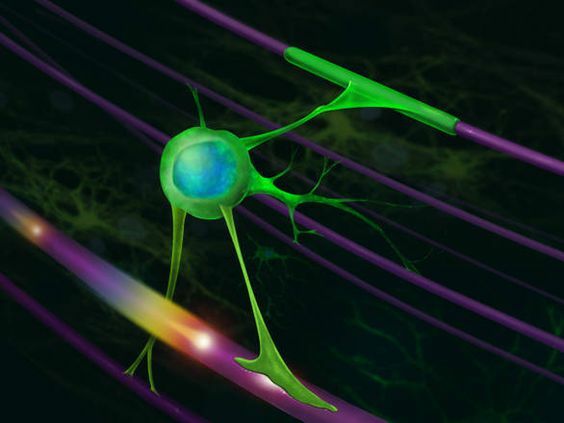 Up to now, researchers have viewed oligodendrocytes as one cell type, belonging to a class of brain cells called glia, with a main responsibility to produce the myelin that insulates nerve processes in axons. Drs. Gonçalo Castelo-Branco and Sten Linnarsson at the Karolinska Institutet led a team of researchers in applying the method to more than 5,000 individual cells from different parts of the brain and spinal cord in both young and adult mice. What they found was surprising. Interestingly, the cells did not start out so distinct. In adolescent mice, the researchers found little difference between the cells in various parts of the central nervous system. But as the mice grew older, the oligodendrocytes became more specialized, a finding the scientists described in their report, published in the journal Science. “The uncovering of this unexpected oligodendrocyte diversity might bring new insights on mechanisms of degeneration and regeneration of diseases where myelin is lost, such as multiple sclerosis,” Dr. Castelo-Branco said.